We offer evidence-based programs (Exercise and Nutrition & Exercise) that improve health to prevent child obesity and its secondary diseases. 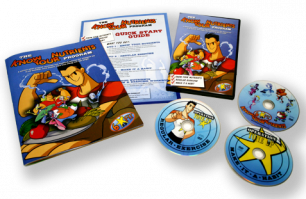 All of our programs are aligned to the National Physical Education and Health Standards and come in 3 versions: 1) School Book/DVD version, 2) Home Book/DVD version and, 3) Online version. In addition, we offer OTU Gear to help you exercise more comfortably and look good. Thank you for shopping with us.